Water bound products have the ability to allow any one to transform a conventional, rough, porous, hard, abrasive concrete swimming poool into a smooth, attractive , softer, easy to maintain, water tight, rubber lined pool. 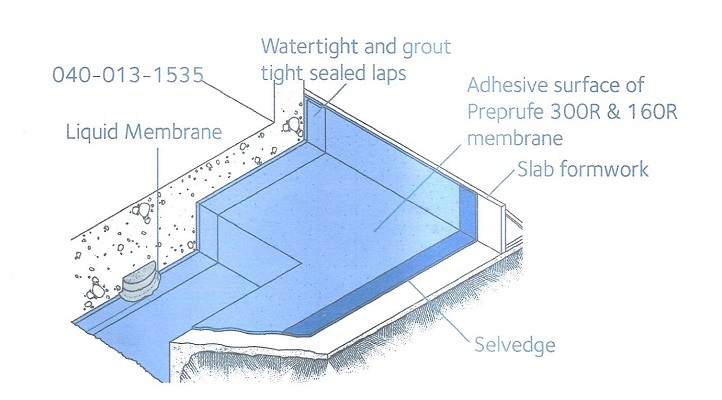 Waterproofing a basement swimming pool or underground concrete water tank requires that the coating and sealants must be capable of retaining a great amount of negative hydrostatic pressure negative hydrostatic pressure is under ground water pressure that passes through the substrate and presses on the back side of the pool coating. Constant hydrostatic pressure from the side walls or from beneath the footing and floor will never detach waterbound products. They will not peel, blister, chip, detaminate, or detach from concrete, concrete block, even in the constant presence of negative hydrostatic, water pressure on a raw edge (the starting or stopping point of the coating. )waterbound is the only complete sealing system with the ability to retain negative hydrostatic pressure at all possible natural levels component coating product may be applied at great thickness like lrb, molecularly bond to them selves and retain negative hydrostatic pressure. Additional are that the coating and repairs remain flexible, are permanentlly bonded to the surface and will expand and contract with the concrete during temperature extremens to remain water tight. We offers contractual work for variety of jobs with specialized expertise in nagetive basement, ug tank, tunnel, canal, dams, swimming pools water proofing treatments. We are proud of our team which has designed new pressure grouting automatic machine of “50 psi to 4500 psi/200 kg/hour grouting cement slury. Our service is provided without damage to the existing surface area of waterproofing by increasing compressive strength and life of r.C.C. Structure without demolishing existing structur e .We are glad to say that this technique is only available with us for soft mud convert to hard. Waterbound is the only waterproofing system that can completely seals any pool permantly, no matter how damaged or deteriorated, waterbound products have repaired many pools that have been determined by experts as un-repairable with no recourse but to fill in the poool and start over, if you feel that your pool is beyond hope, call or e- mail and we will proivede specialized information to solve virtually any pool repair problem. If an in ground pool is constructed with a concrete bottom you can easily and permanently transform and seal the pool using waterbound products to eliminate the need to regularly replace liners and eliminate uv damage, puncture and lateral leaking problems associated with liner pools. Water bound lrb. ( liquid rubber base ripairbound ) a single component polyurethane product, has the unique ability to cure at any thickness of application without gassing and molecularly bonds to it self new to old. 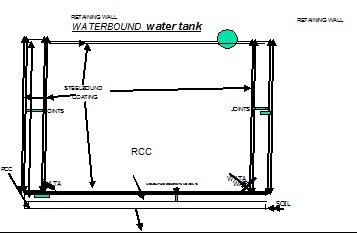 These chemically unique features, when coupled with waterbound ability to penetrate concrete, creates a waterproofing system which can retain almost sixty times the amount of negative hydrostatic pressue normally found in residential or commercial pools, these are some of qualities of waterbound products that sets waterbound above all other products in the world in the field of swimming pool basement underground tank waterproofing. Note. Pool repair for all pool waterproofing instalations, where retaining negative hydrostatic pressure is reequired, it is critical that all slim coatings old paints.Sealers, waterproofing agents etc, must be removed to allow waterbound products to penetrate and bond to the original concrete surfaces. Swimmer injuries along with minor abrasiond cuts and bruises are reduced due to the softer smooth surface. Cracked, leaking or damaged pools re easily and permanentllly repaired, with even major repairs and construction flaws being repaired and hidden by waterbound versatile and flexible qualities, the need to annally patch and repaint the pool along with the inconvenience and expense, is no longesr necessary with waterbound permanent flexibel bonded repair system. If the original waterbound surface is damaged, it is easily spot repaired without complete recoating. If damaged, repairs of lrb (liquied rubber base) weld to themselves, new to old, with a molecular bond which is unique to the coatings industry. Swimming pool deck coatings for non abrasive cool, foot comport with concrete waterprooofing & slip resistance due to unique technical break throughs in polymer chemistry, a complete swimming pool waterproofing, crack and freeze damage repair system is both available and afordable for the home owner or commercial pool property owner Waterbound retains nagative hydrostatic pressure three unique properties allow waterbound products to retain negative hydrostatic pressure unlike any other products in the world, flexible penetration technology, elongation memory technology and permanet flexiblility. With abresive resistant waterbound (liquid rubber primer and top coating) penetrates deeply into the pores of the substrate, (foundation building material) and produces tiny solid rubber sealing plugs due to flexible penetration technology these tiny plugs or sealling tentacles in each and every pore or small crack in the substrate and holds back and retains ground water pressure before it has a chance to reachy the waterbound coating surface to push it off, en masse, as with other types of coatings. These sealing tentacles work like tiny, high pressure, hydraulic o rings and one of the qualities that allow waterbound can hold back great pressure without failure. Elongation memory technology ensures that when waterbound products are compressed and relaxed. They maintain their original shape and size preventing distortion of their original shape and size which is a major cause of release or coatings from powerful forces such as freez/thaw cycles, ground water pressure, vibration and sudden shock concrete is naturally porous typicaly 10 to 18 percent air (extremes 2-60%). To make conrete “workable” a water/cement ration of0.45-0.50 is used but cement only needs 0.25 w/c ratio for hydration. As concrete cures, the surplus water escapes to its surface where it evaporates. This bleeding water leaves a network of tiny capillaries pores. We cannot see the pores. Their size ranges from 3nm (millionths of a part mm size) to 0.1mm (the diameter of a human hair ) . The median is about 1 micron (1,000nm) but a water molecule is 3,000 times smaller (0.28 nm) by all logic, concrete should leak like a sieve so, what holds the water back? Not the concrete but the physics of water it self. Although not as viscous as molasses, it takes pressure to push water through dry microscopic pores. Surface tension holds the blob of water inside the dry pore until its surface gets wet. But add a little water presure during occasional rain storms or condensation on the interior and after a while, the pores gets wet and the concrete starts leaking. Concrete is hygroscopic, it attracts water by sorption and once wet, the pores draw in ground water by wicking (capillary suction). But nothing holds back gases-invisible water vapor and waterbound gase flow right through the pores Permant flexibility provided that waterbound products never harden or becom brittle, they maintain flexibility and only become stronger with age without breaking down as other coatings do waterbound deep penetrates and strengthens week concrete or mortar joints which present detachment from these types of week substrates as other coatings are known to do. Not (1) to pool deck and to all interior wall and floor surfaces apply one slurry coat of waterbound concentrate at a rate of 1.25 lb to 1.5 lb / sq. Yd . Exposed surfaces requiring a uniform finish may be sponge floated. A bonding agent shall be used between the waterbound and any toping material in lieu of a bonding agent, a splatter coat or parge coat of sand and cement may be applied after the waterbound has set but while it is stil green (between approximately 8 to 48 hr. To understand how strong the water bound system actually is you must know the maximum water pressure, (psi. 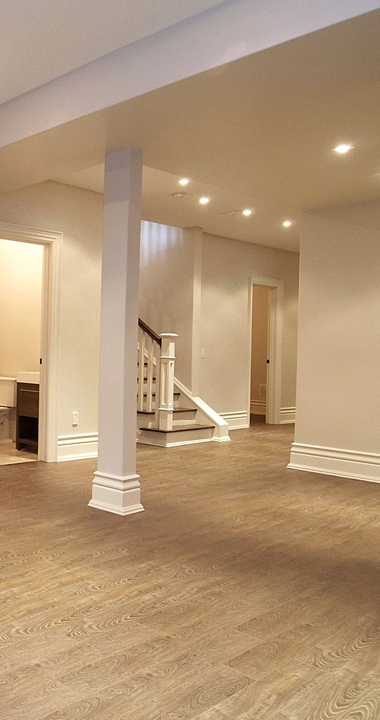 ), your basement walls and floors could possibly be exposed to under the most realistic extreme conditions.The floor of an average residential basement, with a window, would be about 6' below outdoor ground level. Worst case scenario; let’s say that the ground around your basement is totally saturated with water. This would be almost the same situation as if your basement were submerged in a large tank of water all the way to ground level up to the windows! Using the standard formula for pressure and depth (pressure equals depth times 15 divided by 33). Examine the chart above: you see, the average basement wall or floor could have only 2.73 psi. Pressure maximum! Charchit chemical independent lab testing has rated our 1/16" thick system capable of withstanding 10 psi. This means that theoretically our standard 1" lrb/tav basement sealing bead should withstand a maximum of 160 psi ! In actual field installations the system has withstood measured hydrostatic and/or vapor pressures of up to 40 psi without failure! 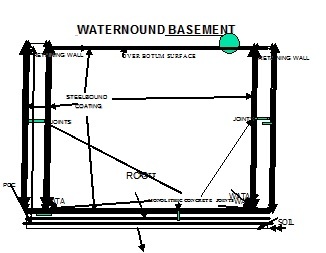 This Means the Standard Waterbound Basement System Is Approximately 60 Times Stronger Than Required to Seal the Worst Basement Under the Worst Possible Conditions Such as a Basement With Large Cracks, Holes or Joints.